To order an ebook press the Add to Cart button for the item required. Payment may be by Card or PayPal account. You can order multiple copies of an item by amending the quantity in the cart and then using the Update Cart option to re-calculate the amount due. To view the ebooks you will need a special free PDF reader called Javelin (for Windows PCs - not Windows RT or Windows pure touch screen tablets - and for Mac OSX computers with OSX 10.6 or later, and for iPADs and Android tablets). You can obtain Javelin for PC and Mac from here and follow the instructions to install the reader. Javelin for iPAD is obtained from the Apple iPAD App Store. Javelin for Android is available from the Google Play App Store. If you purchase multiple ebooks you only need to do this step once. After placing your order you will receive two emails: one from PayPal confirming your payment, and a separate one within 60 minutes giving instructions on how to download and enable (authorise) the special PDF. PicJur files are not printable. If you have any questions please contact us. 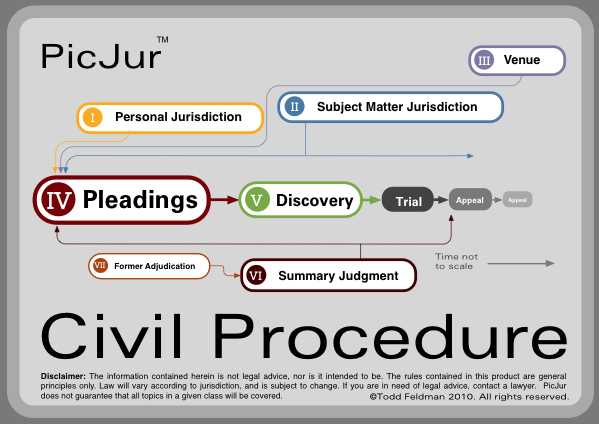 PicJur CivPro - Learn the principles of Civil Procedure in United States federal courts visually. The Civil Procedure Flashcard Deck (89 flashcards) does more than show you how the rules fit together - it allows you to quiz yourself in sequence. The front of each electronic "card" in the deck shows you the topic, and how it fits into the big picture. The back of each card shows you the rules. The Decks are designed for Android phones and iPads - but they're also great on Macs and PCs. For $9.99, you can use the Civil Procedure Flashcard deck on up to two devices. PicJur files are not printable. The Contracts Flashcard Deck (69 flashcards) does more than show you how the rules fit together - it allows you to quiz yourself in sequence. The front of each electronic "card" in the deck shows you the topic, and how it fits into the big picture. The back of each card shows you the rules. The Decks are designed for Android phones and iPads - but they're also great on Macs and PCs. For $9.99, you can use the Contracts Flashcard deck on up to two devices. PicJur files are not printable. The Torts Flashcard Deck (90 flashcards) does more than show you how the rules fit together - it allows you to quiz yourself in sequence. The front of each electronic "card" in the deck shows you the topic, and how it fits into the big picture. The back of each card shows you the rules. The Decks are designed for Android phones and iPads - but they're also great on Macs and PCs. 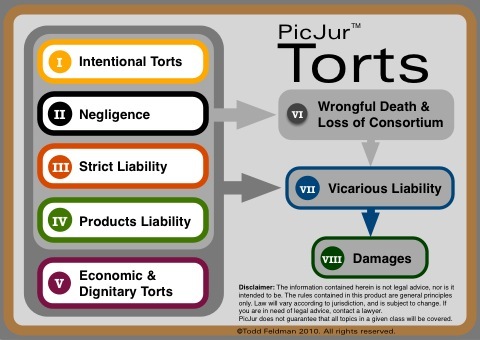 For $9.99, you can use the Torts Flashcard deck on up to two devices. PicJur files are not printable. 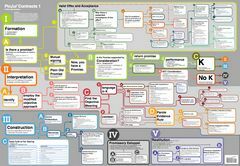 The Civil Procedure Flowchart (6 posters) provides the same information as the flash deck but in large page (poster-like) format, as per the image shown here. For $9.99, you can use the Flowcharts on up to two devices. PicJur files are not printable. 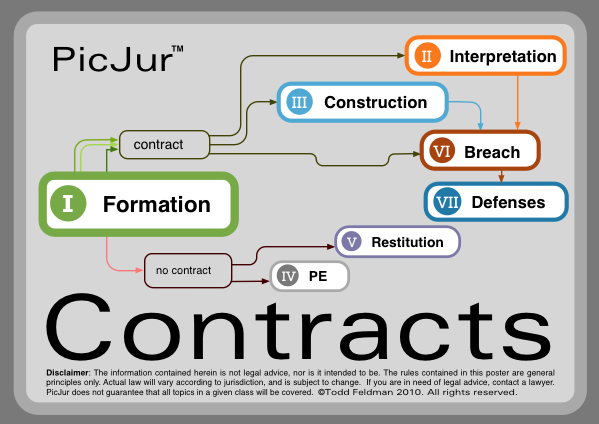 The Contracts Flowchart (5 posters) provides the same information as the flash deck but in large page (Poster-like) format, as per the image shown here. For $9.99, you can use the Flowcharts on up to two devices. PicJur files are not printable. 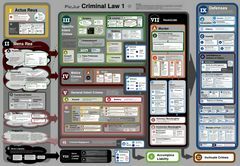 The Criminal Law Flowchart (2 posters) provides information in large page (Poster-like) format, as per the image shown here. For $9.99, you can use the Flowcharts on up to two devices. PicJur files are not printable. 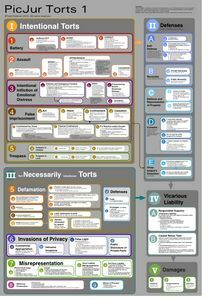 The Torts Flowchart (5 posters) provides the same information as the flash deck but in large page (Poster-like) format, as per the image shown here. 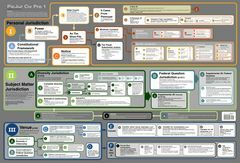 For $9.99, you can use the Flowcharts on up to two devices. PicJur files are not printable.